Nonprofit leader, Atlas Corps Fellow, big sister. 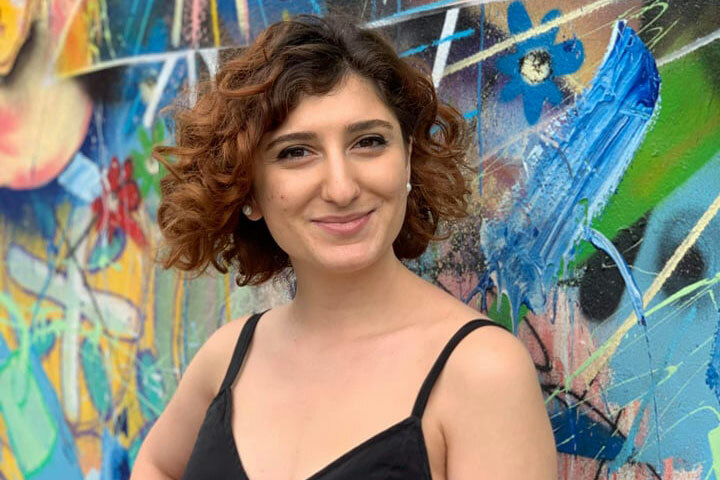 In this new interview, learn what inspired Lida Minasyan to become a women’s rights activist and how working at Global Fund for Children has shaped her career. Lida, can you tell us about where you’re from and about your background? Sure! So, I’m from Armenia. I’m a social worker as my first profession, and a human rights professional; I did my master’s in human rights law. I have been involved in women’s rights activism, since I was 19, as gender-based stereotypes started bothering me since I was at school. In 2012 I joined an organization called Society Without Violence, which is an NGO focused on protecting women’s rights. This organization helped me a lot—to grow, to learn, and to practice—and gave me a space and opportunities as a young, curious feminist. Later, I was offered the position of executive director of the organization, and that was a challenge that I took on with passion and responsibility. My work involved advocacy for integrating gender education in high-school curricula, for adopting domestic violence legislation in Armenia, and for involving women in peace-building processes. When I realized that I needed new international experience, I applied to the Atlas Corps Fellowship, and I was lucky enough to be selected by Global Fund for Children. I came here, and I’m very happy I made this decision! We’re very happy to have you here! Was there a specific moment or personal experience that inspired you to work in women’s rights? There was this young, amazing tennis player who was our neighbor. She got married very young and had to drop sports, becoming a housewife. Only few months after her marriage, she used to come back to her family home bruised, and she would share her story of being abused by her husband with my mom. I was 12 years old back then, and these conversations impacted me immensely. They invoked anger and a feeling of injustice. That really triggered me to think in the future that I needed to do something about this. When I had the chance to be involved in women’s rights activism, I felt that I was in the right place, because this was the thing that I had been looking for. Can you tell us about your work at Global Fund for Children (GFC)? How do you think you’ve influenced GFC during your time here, and how has GFC has influenced you? What has been very valuable for me at GFC is that I’ve always been on the other side—on the NGO side. Being on this side and seeing how a donor organization works helped me learn a lot. I was familiar with the challenges of an NGO, but a donor organization actually faces a lot of similar challenges by being in between, on the one hand providing grants and on the other hand also needing to get grants. One of the things I’ve done is the impact assessment report of GFC’s Maya Ajmera Sustainability Award. This is a unique award, which we’ve been providing since 2005. In doing this impact assessment, I interacted with organizations that GFC has been funding starting in 1997 and through 2018, so I saw the whole history and evolution of GFC through these organizations. I learned so much in such a short period doing this research. It gives you a picture of GFC as a very important figure in these organizations’ development. The grantee partners have been really looking for the coaching and the support that GFC provides, and that’s the uniqueness of GFC. We should be proud of ourselves and work to improve, always improve. I love the period in which I’m here at GFC, because so many new things and positive developments are happening! How would you say that your work at GFC has fit into your professional trajectory? GFC, as I said, helped me a lot to understand the donor perspective. I’ve had the chance to do more research activities, preparing project briefs and working on the regional grantmaking strategy for Europe and Eurasia portfolio, which is very useful for me. I learned from the development team about donor relations and from the programs team about its interaction with grantee partners. I am looking forward to my future collaboration with GFC and at the same time happy to continue my women’s rights activism back in my region. In future, I hope to introduce some innovative mechanisms for breaking gender stereotypes by focusing on adolescents and youth. My brother is my favorite childhood memory. I’m 6 years older than him, and I loved teaching him things and playing with him. I have a whole list! I wanted to be everything from a surgeon, psychologist, and biologist to a teacher, lawyer, economist, and philosopher. What’s your favorite place that you’ve ever traveled? Lida is also a recipient of GFC’s William Ascher Fellowship, a program established in honor of our founding chairperson and long-time champion Dr. William Ascher.